Kobe Bryant (yes, the guy who had to deal with a sexual assault case because he couldn’t resist the trinity) had some words for Metta World Peace (yes, the guy who was suspended for an entire season for charging into the crowd and attacking fans) after the Lakers’ scrappy recent win over the Clippers. He told World Peace “to be the person you were in Indiana.” Again, World Peace was so out of control in Indiana that he attacked a fan because somebody threw a drink at him. If that World Peace comes back, he’s going to clothesline Jack Nicholson for wearing sunglasses at a game. The Lakers have won three of four and are a game back in the Pacific Division, so maybe the Kobe System is working. 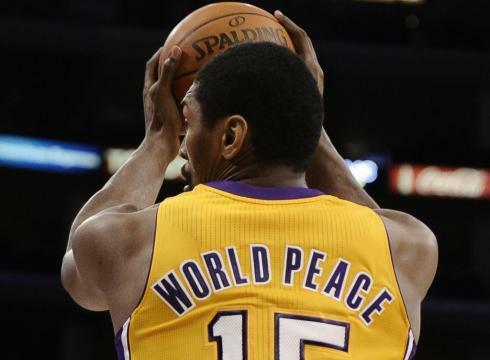 Or maybe it’s the fact that World Peace admitted that “I got bored with defense because it was so easy to stop people over the years” but now he’s starting to come around. I mean, seriously, winning championships, making money, and being popular is so boring.